I went into the kitchen and came out of it a couple hours later with Grand Marnier Cupcakes, an orange spice cupcake brushed with Grand Marnier and then frosted with Grand Marnier buttercream. When Tom got home he thought he was walking into a fight. Instead he walked into dessert. So we sat down and we talked like adults. I told him what I was really mad about and he told me he was hiding this to protect my feelings and very little was going to come of it anyway. Which made sense. So we forgave each other for all the mean things we said over the past few days… and ate cupcakes. All arguments should end in cupcakes. The recipe that borrows heavily from Isa Chandra Moskowitz and Terry Hope Romero’s Vegan Cupcakes Take Over the World. I used their vanilla cupcakes and basic buttercream as base recipes and reworked them for my purposes. Also, due to the inclusion of alcohol, I feel I have to mention that this is for adults only. “Adult” being determined by whatever your local laws are… which makes very little sense… but whatever… BOOZY CUPCAKES! Preheat oven to 350 degrees Fahrenheit. Line a 12-cup muffin pan with pretty cupcake liners. If they are not made of parchment paper, spritz them with a bit of cooking spray so they easily release from the cupcake. Zest the orange and then juice it into a 2-cup liquid measuring cup. This should result in about 1/4 cup of juice. *Add enough soy milk to the orange juice to equal 9 fluid ounces, or 1 cup + 2 Tablespoons of total liquid volume. Let this sit for 5 minutes. In a medium bowl, whisk together flour, cornstarch, baking powder, baking soda, salt, and pumpkin pie spice. Set aside. In a large bowl, whisk the orange juice and soy milk mixture with the oil, sugar, orange zest, and vanilla until well combined. Add the dry ingredients and mix until no large lumps remain. Divide the batter between the 12 cupcake liners, filling them about 2/3 full. Bake for 20-22 minutes, or until a toothpick inserted into the center of a cupcake comes out clean. Remove the cupcakes from the pan and place on a rack. Brush the tops of the hot cupcakes with Grand Marnier. Cool completely before frosting. Midway through the cooling process, brush the tops with more Grand Marnier. You may do this more if you like. Just don’t make your cupcakes soggy. In a large bowl, whip the margarine and shortening together with an electric mixer until well combined and fluffy. Add the powdered sugar and continue mixing –slowly at first so you don’t end up with a cloud of powdered sugar– for 3 minutes. It will look like a clumpy mess, but this is necessary so the sharp little particles of sugar can cut air pockets into the fat. Add the Grand Marnier and vanilla extract and beat on high speed for 5 to 7 minutes until your frosting is fluffy. Pipe (or spread) on to COMPLETELY COOLED cupcakes. No they can’t even be a little warm. No. Put them in the freezer for 20 minutes if you’re so impatient. 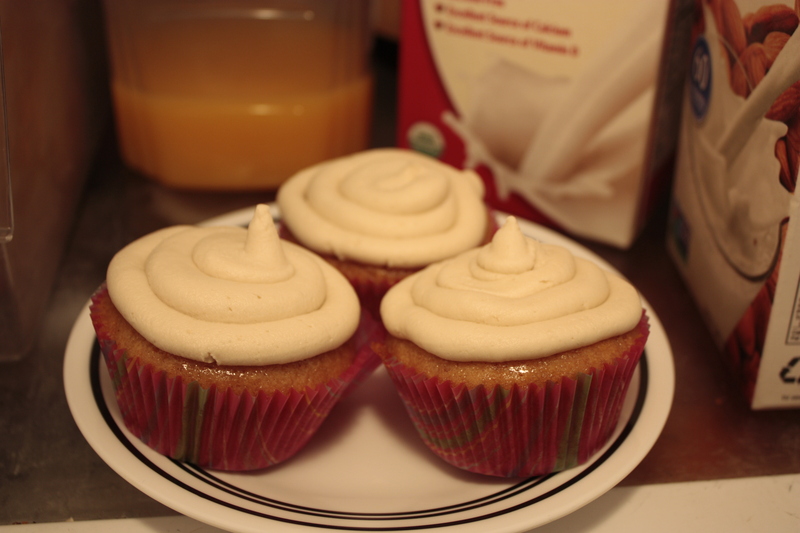 If your frosting is done before your cupcakes are cool, just park the bowl in the fridge while they’re chilling out. Be sure to whip the frosting one final time before piping if you do this, though. Just so everything is soft and easy to get out of the pastry bag. « Ridiculous Grilled Cheeze Time with ClassyVegan! Cupcakes – the great conflict resolver! I’m glad your evening ended well and your cupcakes look lovely. Glad to hear Pancakes is ok, too! Those cupcakes sound amazing – sorry about the weekend, but glad it was resolved!